I had this idea to create a signature stamp for myself after designing this logo for my web site. I predominantly use birch panels for my painting supports and sign the backsides. 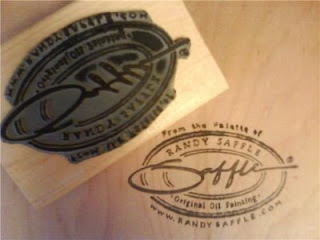 Now that will also contain this official, one of a kind, get it only here logo stamp. It is cool. What a brilliant idea. Anything to add value and credibility to your work. Did you order through Kinkos or online? Thanks Perry. I ordered it online. This one is 3" x 4" and cost $36 including shipping. It wasn't cheap but I think it does add to my art. Nice work on your Blog also. I will continue to check it out. Randy - very very cool! !